Share every detail with the LifeCam Cinema. This full-featured webcam, with ClearFrame image-processing technology, delivers smooth, detailed 16:9 video in full 720p HD quality and crystal-clear audio. Sharp Close-ups: The auto-focus feature on the LifeCam Cinema works just like the auto-focus feature on your digital camera to keep your video sharp no matter how close an object is to the LifeCam. Auto Focus is built right into the camera, so there’s never a need to adjust the focus by hand. Smooth Video: ClearFrame is an innovative technology that provides smooth, detailed video at any resolution— even in low-light conditions. ClearFrame features an image processing technology that helps to efficiently send the information from the webcam to your computer, reducing the “ghosting” effect. Video noise reduction software reduces image graininess—especially in low light—to keep your video sharp and clear. 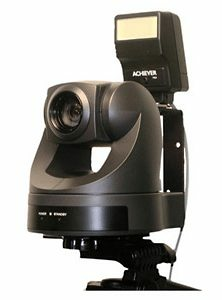 Aluminum Body: Light weight with improved the durability of the webcam body. Flexible Stand: Bends, folds and shapes for the best angle on laptop screens, flat panels, and traditional monitors. Windows Live Movie Maker: Start a movie project with one click, and then upload widescreen video to social networking sites, with Windows Vista or later. Windows Live Photo Gallery: Easily upload a photo that you can edit, tag, and share. Windows Live Call Button: The easy way to start a video call with Windows Live Messenger. Video Effects: Discover a fun way to express yourself with these entertaining video effects built into the LifeCam dashboard.